Home > News > News > Fredericton Volkswagen Wins Wolfsburg Crest for the Sixth Time! Volkswagen Canada proudly presented the 2019 Wolfsburg Crest Club Membership award to Fredericton Volkswagen. Since Rob Ricketts and his team took over the dealership in 2005, Fredericton Volkswagen was recognized six times by the Wolfburg Crest Club. Each year, dealerships that work hard to offer outstanding sales and service can earn this recognition. It is no surprise that Fredericton Volkswagen is once again the recipient of this prestigious award! 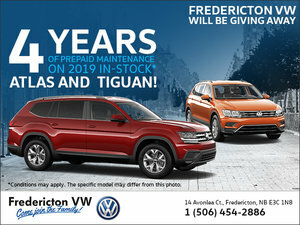 At Fredericton Volkswagen, the customers are the real winners! As a family-oriented business, the management team and dedicated staff pride itself on creating a customer-first culture and delivering the best experience to every individual who visits the dealership. Fredericton Volkswagen is the largest VW dealership in the region. From their vast inventory of new and used Volkswagen models to exiting financing programs, Fredericton Volkswagen is set up to ensure your complete satisfaction. We are located at 14 Avonlea Ct and are proud to have served the local community of Fredericton for more than 13 years.